I took the case apart on my 1946 Mill Hi-Top dime machine and kept track of almost everything. I started the reassembly and discovered I had no idea where this part went. It has its own screw but I don't find any left over empty holes to put it in on any of the front pieces, sides, or bottom. I don't think it's too important as it looks like some deflector. The end away from the screw is not not perpendicular but rather at a slight angle. The piece is 1.5" wide and 2.25" long, the bend is about 45 degrees. Anti drill plating piece. 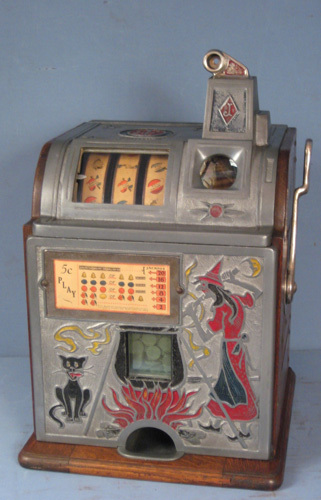 It is mounted where the chute that goes into the jackpot is screwed into the lower front casting. It uses the same screw that is holding that chute to the front casting. Aha! That explains why I have no screw for the chute. My chute was not attached there as it is slightly bent out for some reason. I guess this piece was there by itself. Thanks so much for clearing this up.